I've always thought of vocalist Michael Kiske, especially after leaving Helloween, as a voice searching for its proper context. He has quite the gift easily able to transverse between smooth melodic rock and blistering heavy metal. Lately, and after listening to last year's 'Past In Different Ways,' Kiske seems to be adrift a sea of artistic confusion. The second installment of Kiske's Place Vendome finds the vocalist in the port of melodic rock. The first Place Vendome dropped off my radar quickly upon its appearance like a commuter jet hit by a flock of errant geese. Frankly, I wasn't expecting much this time and I wasn't disappointed. But then things begin to sputter like a precision car engine trying to run on ethanol laced gasoline. 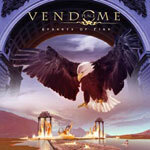 To the end Place Vendome, even with Kiske's more than impressive vocals, is a simple measure of average melodic rock. The only remarkable songs are the powerful and symphonic rock ballad 'Set Me Free' and the following solid rocker, 'Believer.' Honestly, once you have arrived here, you've heard the best that 'Streets Of Fire' has to offer. 'Streets Of Fire' picks up where Michael Kiske left off with the first installment of Place Vendome, AOR-like melodic rock. Kiske himself is more than competent aa usual. However, this short work begins strong only to drift into melodic rock mediocrity near the middle. This one is definitely for the fans of Kiske first and foremost.